There’s nothing better on a warm day than cold pasta salad. Living in Florida we have plenty of those day even right now in early March, when it’s still snowing everywhere else. 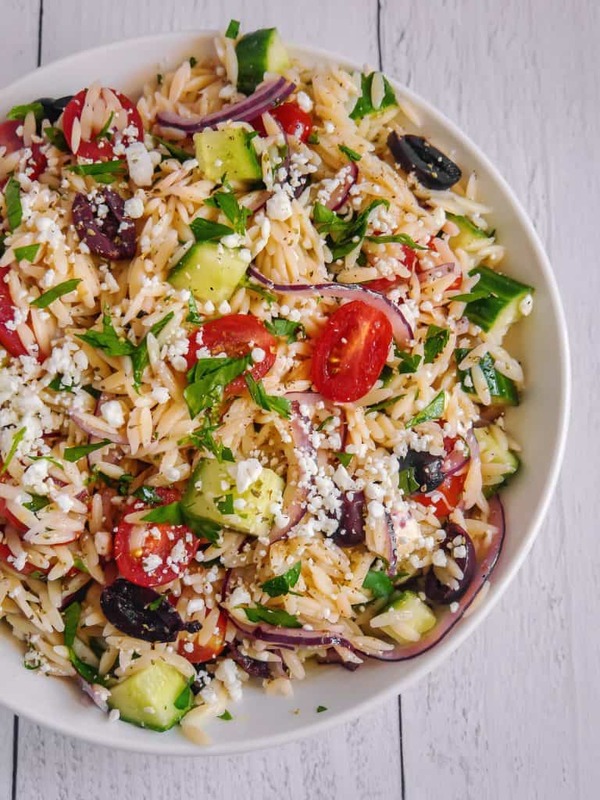 Even without warm weather, this orzo pasta salad is perfect for travel or work since you don’t need to heat it up! There are endless options with ingredients when making pasta salad. I decided to go the Greek route, since I’ve been on a Greek Salad kick lately. 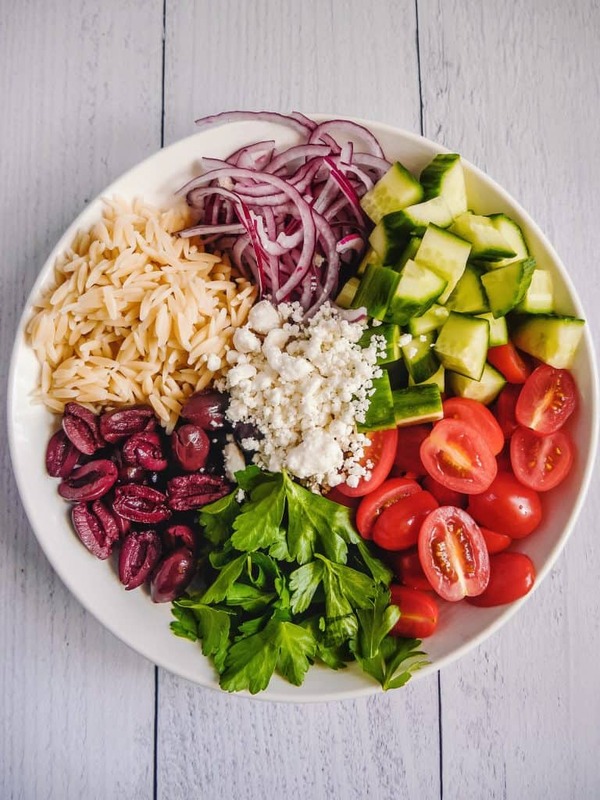 The flavors of the kalamata olives, feta, and cucumbers, go so well with an oregano and lemon vinaigrette. 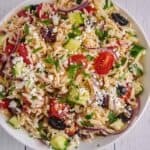 Another reason I love this pasta salad recipe, is it’s easy and quick to make. 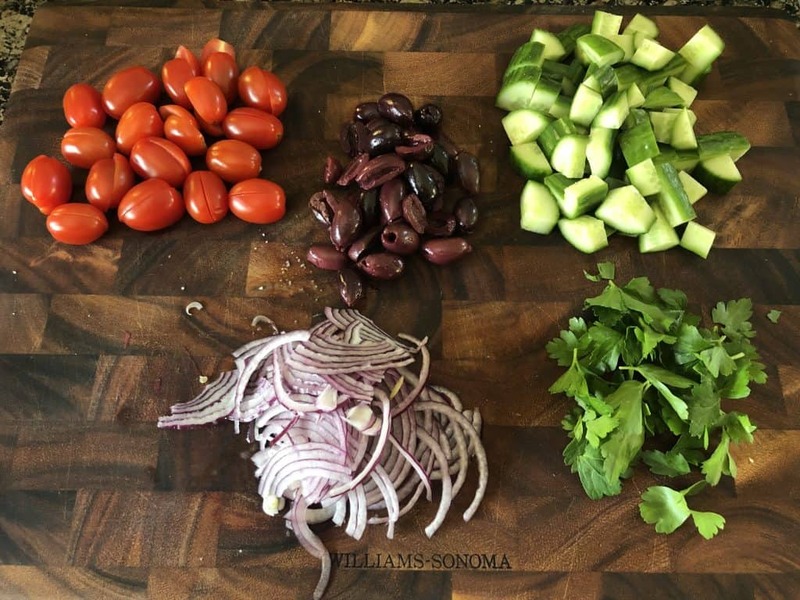 I chopped up my cherry tomatoes, kalamata olives, cucumber, and parsley. I sliced my red onions on the mandoline for them to be more uniform, but please be careful and use the guard. If you do not have a mandoline, you can easily just thinly slice with a knife. 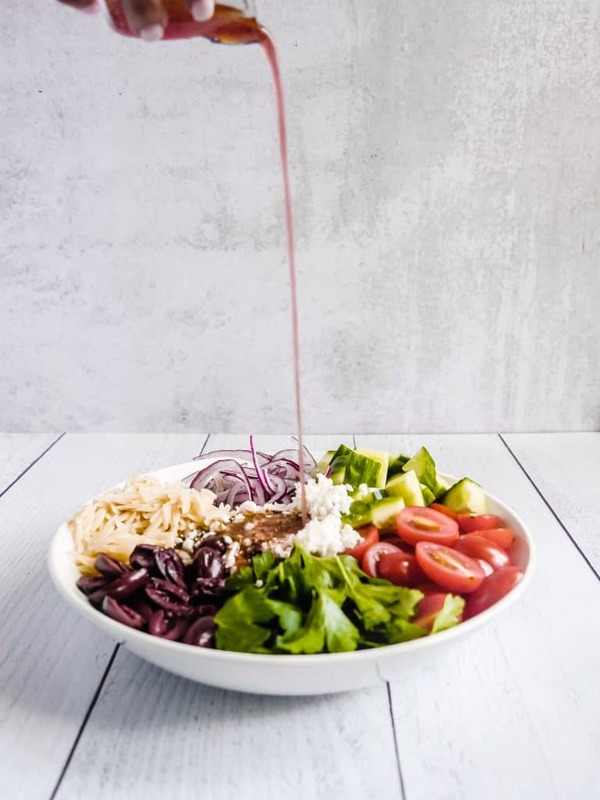 My favorite part of any pasta salad is the dressing or vinaigrette that it’s in. When the pasta soaks up all that flavor, every bite is so delicious. For this recipe I decided to use olive oil, red wine vinegar, lemon, oregano, salt, and black pepper. 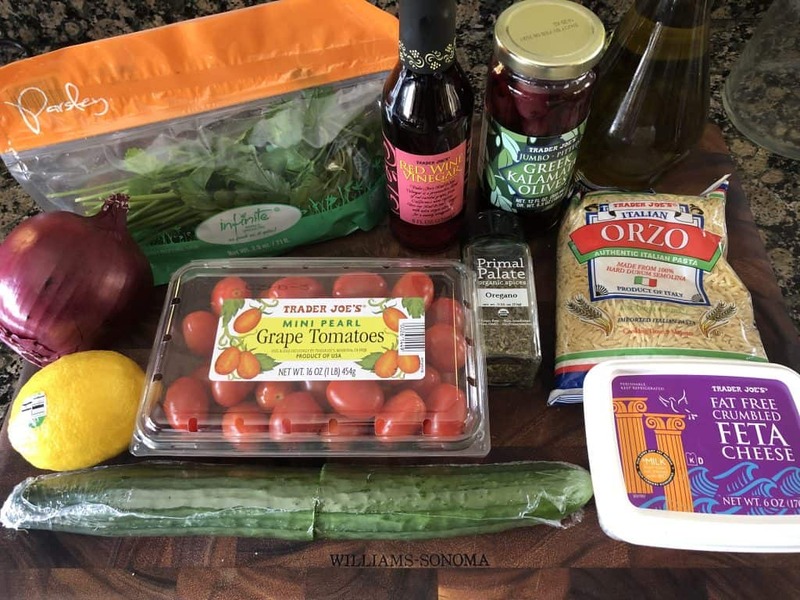 These basic ingredients come together to make such a bright vinaigrette. I cooked my orzo al dente, you do not want to overcook it because when it soaks up all the vinaigrette it will get soggy. Once al dente, I remove from the pot, drain, and allow it to cool before adding it to the dish. I allow the dish to “marinate” for about an hour in the refridgerator before enjoying it. 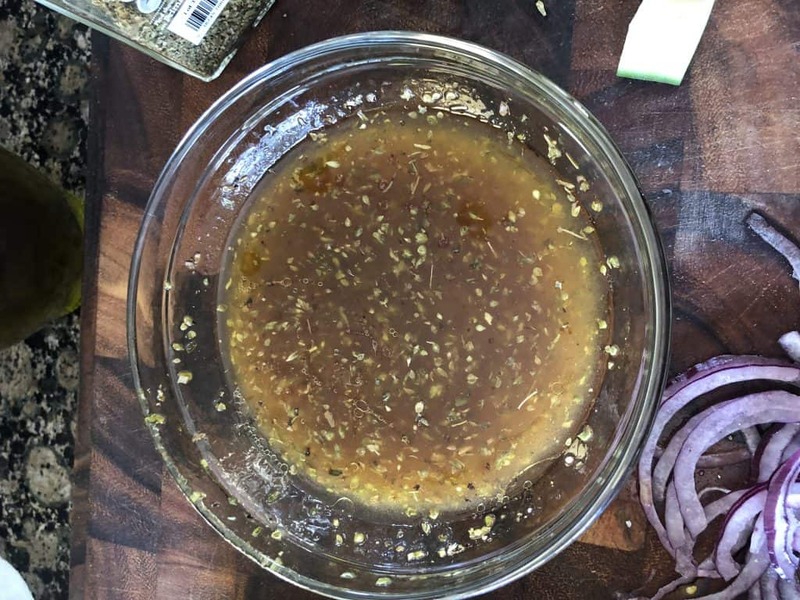 This will allow all the ingredients to get cold (for that refreshing bite) and most importantly to give the ingredients a chance to meld with the vinaigrette. In the end you are left with a bright and refreshing dish that is perfect for picnics or to enjoy throughout the week. 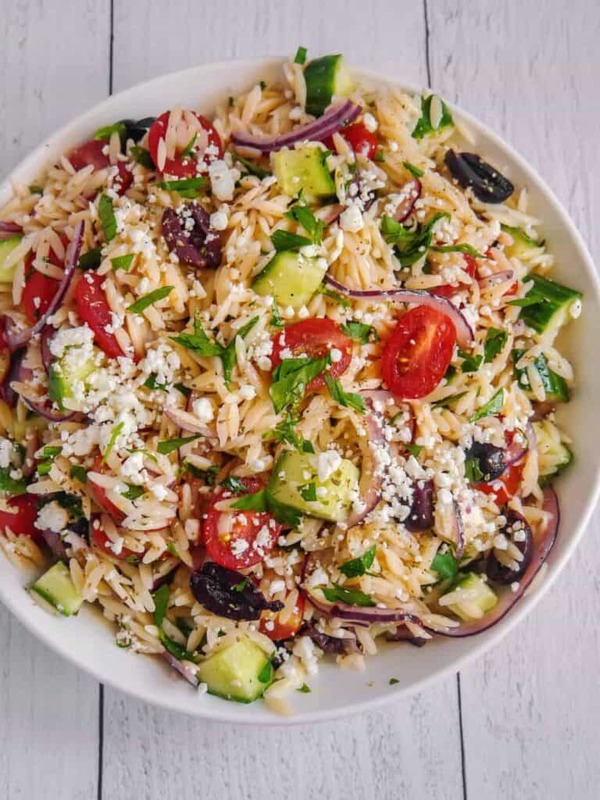 Greek orzo pasta salad with delicious vegetables and marinated in a lemony oregano vinaigrette. 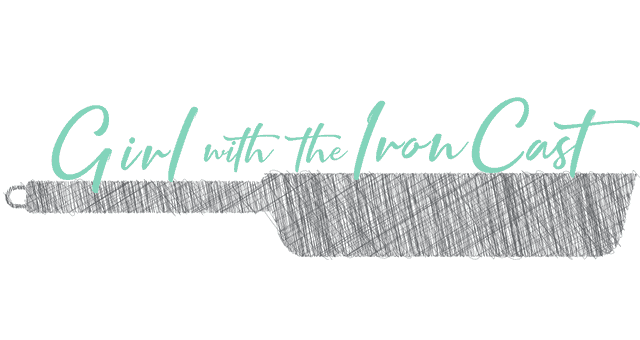 Perfect for a cookout or to enjoy meal prepped throughout the week! In a small pasta pot, cook pasta al dente according to package instructions. Remove from heat, drain, rinse the pasta, then set aside. In a small bowl, whisk together the olive oil, red wine vinegar, lemon juice, oregano, salt, and pepper. Set aside. In a large mixing bowl, add all the ingredients including the vinaigrette. Toss to ensure all the ingredients are combined. Place in refrigerator for at least an hour before serving to marinate. Can drizzle a little olive oil when enjoying leftovers if needed. I used to LIVE on greek salads in high school so this really takes me back. Looks awesome!